The highest risk of typhoons is during October and November. They can occur, however, year-around. An average of three tropical storms and one typhoon pass within 180 nautical miles (330 km) of Guam each year. The most intense typhoon to pass over Guam recently was Super Typhoon Pongsona, with sustained winds of 125 miles per hour, which slammed Guam on December 8, 2002, leaving massive destruction. Most of the island has state of the art mobile phone services while digital cable and high speed internet are now widely available through either cable or DSL. As Guam is also part of the U.S. Postal System ("state" code: GU, ZIP code range: 96910-96932), mail to Guam from the U.S. mainland is considered domestic and no additional charges are required. Private shipping companies, such as UPS, DHL or FedEx, however, have no obligation to and do not regard Guam as domestic. The speed of mail traveling between Guam and the states varies depending on size. Light, first-class items generally take less than a week to or from the mainland, but larger first-class or Priority items can take a week or two. Fourth-class mail, such as magazines, are transported by surface after reaching Hawaii. Most residents use post office boxes or private mail boxes, although residential delivery is becoming increasingly available. Incoming mail not from the Americas should be addressed to "Guam" instead of "USA" to avoid being routed the long way through the U.S. mainland and possibly charged a higher rate (especially from Asia). Most residents travel within Guam using personally owned vehicles. The local government currently outsources the only public bus system (Guam Mass Transit Authority), and some commercial companies operated buses between tourist-frequented locations. Wildfires plague the forested ("boonie" or "jungle") areas of Guam every dry season despite the island's humid climate. Most fires are man-caused with 80 percent resulting from arson. Poachers often start fires to attract deer to the new growth. Invasive grass species that rely on fire as part of their natural life cycle grow in many regularly burned areas. Grasslands and "barrens" have replaced previously forested areas leading to greater soil erosion. During the rainy season sediment is carried by the heavy rains into the Fena Lake Reservoir and Ugum River leading to water quality problems for southern Guam. Eroded silt also destroys the marine life in reefs around the island. Soil stabilization efforts by volunteers and forestry workers to plant trees have had little success in preserving natural habitats. 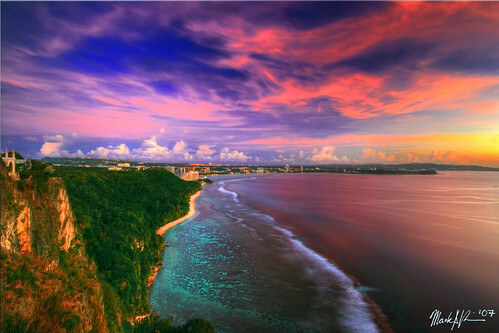 Guam exemplifies the effects of bioinvasion. Thanks for the info; I've already done plenty of research! I'm trying to not be too obssessed because I don't want to be disappointed, but it's still fun to entertain the idea!